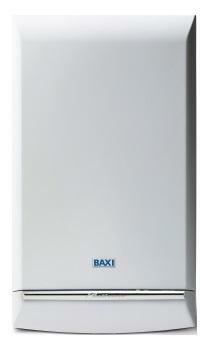 The Duo-tec Combi 28 Gas Boiler is a wall mounted combi from Baxi. The Duo-tec was CORGI boiler of the year as well as being Baxi’s best seller. This boiler is designed to save you money on heating bills thanks to its user friendly controls with a clear and easy to read display. The controls are uncomplicated with an easy to read pressure gauge. It has stylish soft curves and a modern chrome strip finishing accompanied by a beautiful gloss white finish, making it easy to use as well as aesthetically pleasing. This boiler comes with a high flow rate to help ensure that you're never without hot water. It comes in the output of 28kW and is B rated for both heat and water as well as having an efficiency rating of 88.6% making it a highly efficient boiler. This range comes in other outputs such as 24kW 28kW which is a dedicated LPG model as well as the standard 28kW boiler and 33kW and 40kW outputs, meaning the Duo-tec combi boiler is suitable and can fit any sized home as well as anyone's needs. Featuring a built in frost thermostat to help increase the flexibility of the boiler allowing it to be placed in garages or lofts. With the frost thermostat you have the security of the water never freezing over on those cold wintery days. This boiler comes with a pre-plumbing jig, a pre-formed copper pipe tail, built in filling loop, and a one metre mains cable to help save you time and money making it easy to install. Compatible with multifit flue kits which provide an industry leading choice of lengths, bends and accessories allowing you to place it pretty much anywhere in your home. This boiler also comes with 7 years warranty.